Since measles is still common in many countries, unvaccinated travelers bring measles to the U.S. and it can spread. Protect yourself, you family, and your community with the measles-mumps-rubella (MMR) vaccine, especially before traveling internationally. I think I have measles. What should I do? My doctor or someone from the health department told me that I have measles. What should I do? If you have measles, you should stay home for four days after you develop the rash. Staying home is an important way to not spread measles to other people. Talk to your doctor to discuss when it is safe to return. Disinfect frequently touched surfaces, such as toys, doorknobs, tables, counters. Call your doctor is you are concerned about your symptoms. If you’re not sure whether you were vaccinated, talk with your doctor. More information about who needs measles vaccine. Before the measles vaccination program started in 1963, about 3 to 4 million people got measles each year in the United States. Of those people, 400 to 500 died, 48,000 were hospitalized, and 4,000 developed encephalitis (brain swelling) from measles. What are the vaccine coverage levels like in the United States? A: Nationally, the rates of people vaccinated against measles have been very stable since the Vaccines for Children (VFC) program began in 1994. In 2016, the overall national coverage for MMR vaccine among children aged 19—35 months was 91.1%. However, MMR vaccine coverage levels continue to vary by state, with MMR coverage levels of < 90% observed in 2016 in several states and local areas. At the county or lower levels, vaccine coverage rates may vary considerably. Pockets of unvaccinated people can exist in states with high vaccination coverage, underscoring considerable measles susceptibility at some local levels. For more information about 2016 childhood vaccination coverage, see a CDC MMWR. Where do cases of measles that are brought into the United States come from? Travelers can bring measles into the United States from any country where the disease still occurs or where outbreaks are occurring including Europe, Africa, Asia, and the Pacific. Worldwide, the 19 cases of measles per 1 million persons are reported each year; about 89,780 die. In recent years, many measles cases came into the United States from common U.S. travel destinations, such as England, France, Germany, India. During 2014, many measles cases came from the Philippines and Vietnam. For details about the increase in cases by year, see Measles Outbreaks. communicating with public health officials from states with reported measles cases and providing technical assistance. gathering data reported by states on confirmed measles cases and evaluating and monitoring these data from a national perspective. testing specimens for difficult diagnostic cases of suspected measles infection when requested by states. using Advanced Molecular Detection (AMD) methods to determine measles virus genotypes and strains. providing rapid assistance on the ground during outbreak investigations, often through a formal request by the state health department. investing in state and local health departments for public health infrastructure and laboratory capacity to support front-line response to suspected and confirmed measles cases. alerting clinicians, healthcare facilities, and public health officials around the country about current outbreaks and providing vaccine policy and clinical guidance for healthcare providers. providing information to public and healthcare providers through a variety of media including the CDC website. Has measles been eliminated from the United States? Yes. In 2000, the United States declared that measles was eliminated from this country. 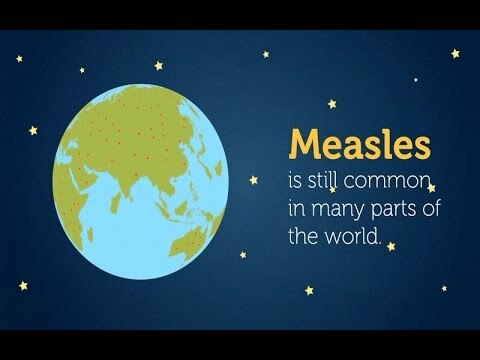 The United States eliminated measles because it has a highly effective measles vaccine, a strong vaccination program that achieves high vaccine coverage in children, and a strong public health system for detecting and responding to measles cases and outbreaks. What does “measles elimination” mean? CDC defines measles elimination as the absence of continuous disease transmission for 12 months or more in a specific geographic area. Measles is no longer endemic (constantly present) in the United States. If measles is eliminated, why do people still get it in the United States? Most people in the United States are protected against measles through vaccination. So measles cases in the U.S. are uncommon compared to the number of cases before a vaccine was available. Since 2000, when public health officials declared measles eliminated from the U.S., the annual number of people reported to have measles ranged from a low of 37 people in 2004 to a high of 667 people in 2014. Yes. Since measles is still common in many countries, travelers will continue to bring this disease into the United States. Measles is highly contagious, so anyone who is not protected against measles is at risk of getting the disease. People who are unvaccinated for any reason, including those who refuse vaccination, risk getting infected with measles and spreading it to others. And they may spread measles to people who cannot get vaccinated because they are too young or have specific health conditions.